Academics and students alike came together in the Science Atrium last Thursday to mark the official launch of the Centre for Women in Science (WinS) at Wilfrid Laurier University. Approved by the senate in May, the centre aspires to be a hub for female scientists and researchers at Laurier and in the community. According to Hind A. Al-Abadleh, the associate director of WinS, there are still many obstacles that hinder women in achieving a greater status in the science community. “Certainly, the physical sciences and the mathematical and social sciences have been male dominated fields, and that has in turn have kept most of the females outside unless those who blessed with having mentors,” explained Al-Abadleh. The event featured a short presentation where the attendees were told about some of these challenges that women face in various fields of science. Currently in Canada, only about three per cent of the natural sciences and engineering workforce is made up of women, and, in 2008, only 30 per cent of science and math graduates were women. She added that the centre will also encourage female students to find careers in science, as well to provide opportunities for students at the elementary and secondary level if they are interested in pursuing science in university. 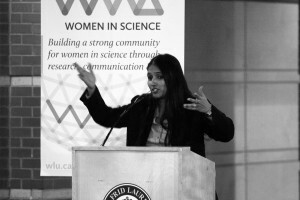 “What we’re trying to do — the centre’s mission — is to build a community of women in science at Laurier and through action, through outreach and communication,” she added. In attendance for the grand opening was Melissa Franklin, the chair of the physics department at Harvard University, who had something to say about the role women will play in the future of science. “It’s a big cause, [they’re] doing something very interesting,” Franklin told The Cord. For Al-Abadleh, the launch of WinS was a huge accomplishment, especially since she has been working on the founding committee. She noted that the centre will be working in conjunction with the local high schools, the University of Waterloo and businesses, all of which have been already advocating for women in scientific research. What makes this centre different, however, is that its main focus is research. “It’s not only aimed to give support and mentorship, but also at doing research through grants and scholarships for researchers to look in to the areas [of study],” she continued. But the centre currently doesn’t have a set location, something that Al-Abadleh hopes will be figured out soon. Regardless, she hopes the centre sparks a passion within female students about science. “Embrace your passion, and [the centre] will help you through the process,” she concluded.